As you may have gleaned, things have been rather busy recently chez Duver Diary and it was mid November before I suddenly realised I hadn’t returned my Mason Bee tubes. Thankfully it’s been mild here so I thought it was still worth doing. I pulled out all the tubes and, as instructed, where no ‘cap’ was visible I held them up to the light to see if the tube was blocked (because apparently tubes can be occupied even if not capped) and sure enough there were a number which were blocked. Happily, whereas in my last post in September I thought I had seven capped and therefore occupied tubes, when I actually investigated them all, there were fourteen! 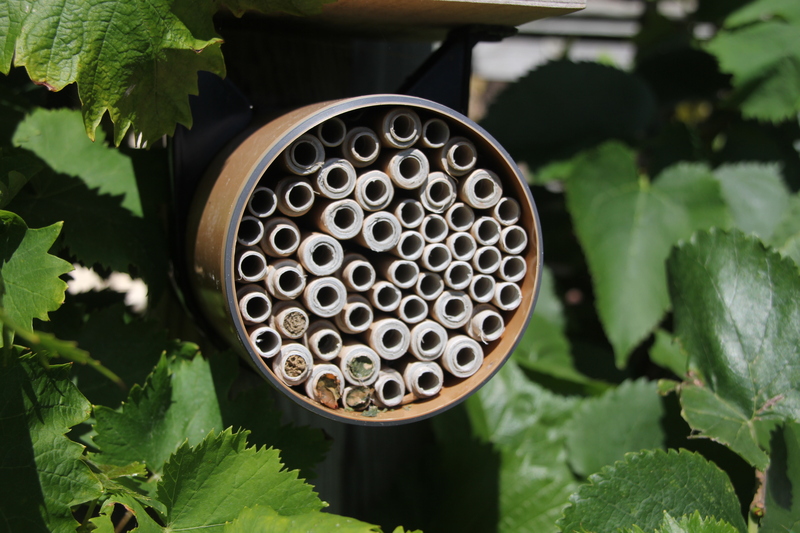 As explained last time, some of the tubes appear to have been capped by leaves not mud – see below – and these are occupied by leaf cutter bee coccoons. Mason Bees UK don’t want these returned, so I’m following their instructions to look after these at home. I’ve now sent all the mud capped tubes off in a Jiffy bag and am looking forward to receiving another set of Red Mason Bee cocoons in the spring. 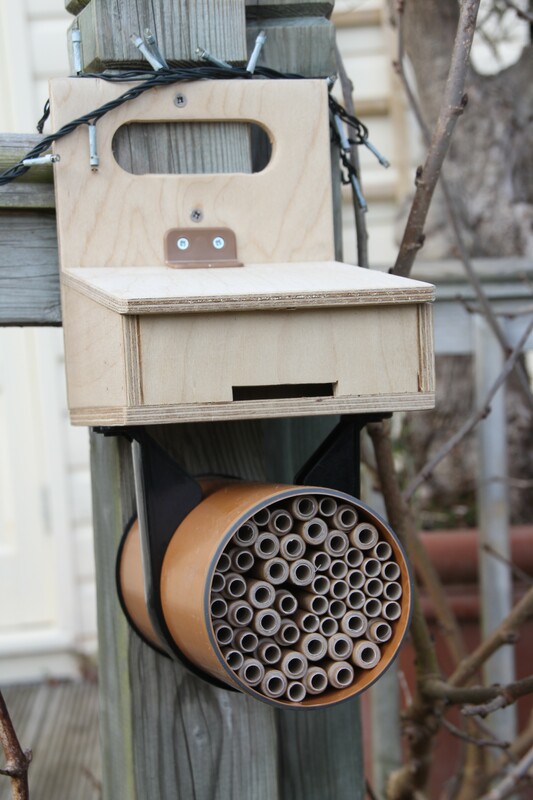 With thanks to Mason Bees UK for making it all so easy. This entry was posted in Mason bees, Red mason bees, Uncategorized on November 21, 2016 by jenhumm116. 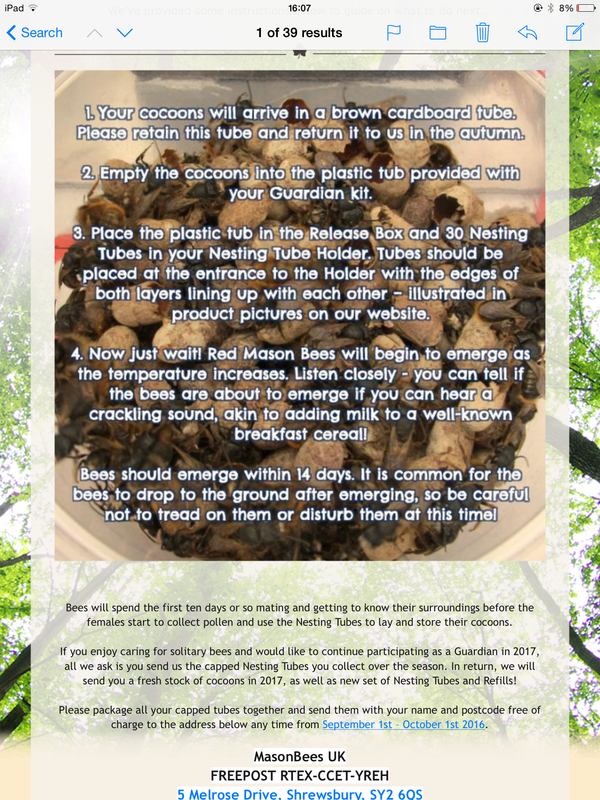 I recently received an Autumn Newsletter from Mason Bees UK, the suppliers of my Red Mason Bee cocoons earlier in the year. It’s apparently now time to bring the nesting tubes inside to check if they are occupied. 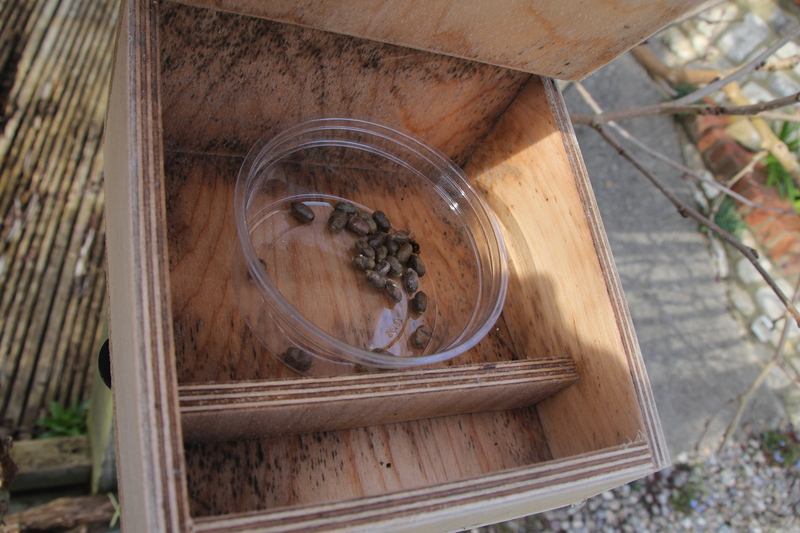 The ones with mud caps (two of mine above) are likely to be occupied with Red Mason Bee cocoons. However, there might also be cocoons in uncapped tubes, so we’ve been invited to remove the tubes from the the holder and hold the them up to the light to see if there is anything inside. If the tube is occupied, the inside tube should be removed from the outer either by hand or needle nosed pliers. Once removed they should be returned to Mason Bees UK for safekeeping over the winter. New cocoons will be sent out in the spring. So, that’s two occupied tubes taken care of, what of the other five which are capped but look different? Apparently these are likely to be inhabited by Leafcutter Bee cocoons and the newsletter explained how I can look after these at home. Knowing these were likely to be leafcutters I looked at nearby leaves and, sure enough, some exhibited the neat circular holes that leafcutters make. Interestingly the newsletter shared evidence that ‘second hand’ outer tubes (ie reused for a second year) seem to attract nesting bees more readily than brand new tubes which is thought might be due to a pheromone effect, so hopefully next year I might have even more success. This entry was posted in Garden, Leafcutter Bees, Mason bees, Red mason bees on September 6, 2016 by jenhumm116. I’ve blogged here and here about this year’s new foray into keeping red mason bees. After a rather shaky start with an inadvertent toasting of the cocoons by the Aga, I was glad to see that some of the nesting tubes have been ‘capped’ suggesting that new cocoons have been laid in there. On Saturday, witnessed by my Book Club ladies, I did see a bee coming and going from one of the uncapped tubes, but of course when I returned to photograph it it got camera shy and disappeared. I certainly haven’t been aware of, or troubled by any extra bees this year and did wonder whether none had actually survived, but they clearly have and I’m chuffed to bits to have a count of five capped tubes. 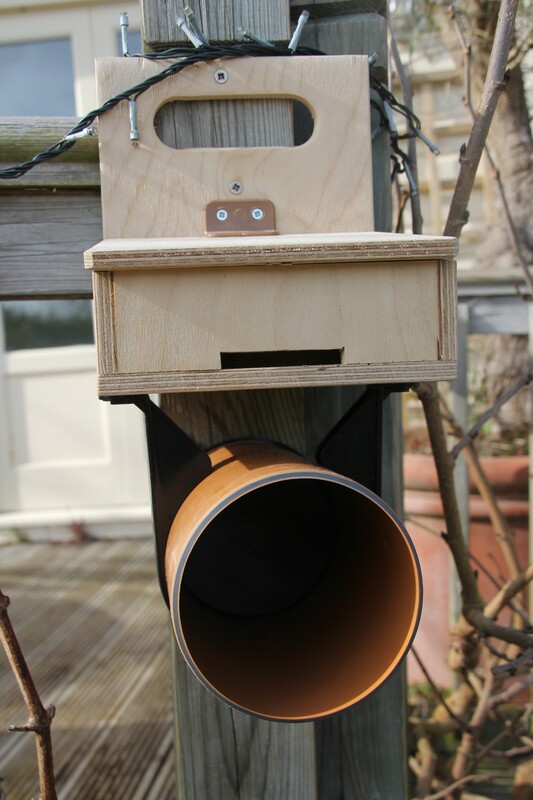 The tubes will be returned to Mason Bees UK in September and in return they will send out new cocoons next spring. I’ll keep you posted of the final count, but in the meantime I’ll look forward to a bumper veg harvest thanks to my friendly little pollinators. This entry was posted in Garden, Mason bees, Red mason bees on August 1, 2016 by jenhumm116. This is the email I received on Thursday and read, whilst still at work in London. By the time I’d returned home later that evening I’d completely forgotten about it and consequently didn’t mention it to the OH. I left the island again on Friday morning to spend a lovely weekend with my daughter, including the whistlestop visit to Nymans I blogged about yesterday. I was only reminded of the email when I walked into the kitchen on Sunday evening and saw a small Jiffy envelope in a pile of post next to the Aga. I immediately moved it out of the kitchen, but it was with a certain amount of trepidation that I opened the package the following day. And indeed roped in the OH – hence the hand below. As the email explained, the bees would emerge as the temperature increased, but as you can see, a gentle toasting by the Aga, clearly made one of them think it was time to make an entrance. Hopefully the remainder will follow the usual schedule and won’t have been damaged by their roller coaster temperature experience. As instructed, we placed the tub in the release box (already looking rather mouldy due to rain seeping in by the hinge, again, I hope that doesn’t matter). And then filled the empty nesting tube holder with nesting tubes. Having read the website after filling the tubes I realise we’ve done a couple of things wrong – firstly the tubes were in rubber bands which we took off, but apparently they help prevent birds pulling the tubes out. And secondly, the smaller tubes are ‘inner’ tubes and shouldn’t have been used, they are spares to replace the inners when they become ‘capped’. I’ll sort this out when I get back this Thursday. Meanwhile we wait – and thank goodness I didn’t try honey bees…. This entry was posted in Garden, Red mason bees, Uncategorized on April 5, 2016 by jenhumm116. Some of you may have read an article by Val Bourne in the Saturday Telegraph in February regarding red mason bees (Osmia bicornis). The article explained that red mason bees are an endangered native, thought to be between 120 and 200 times more efficient than honey bees at pollination. Chris Whittles from Mason Bees UK, who supplies the bees to commercial growers to help increase yields, is now making the bees available to domestic growers too. I have always been interested in bees but didn’t feel I had the time or expertise to take on a honey bee hive, but, welcoming some mason bees into my garden all seems to make a lot of sense. They don’t sting (good) and don’t produce honey (not really bothered) but do stay close to the nest and thus will hopefully concentrate on pollinating my plants rather than my neighbours’! I signed up for my nest and it was delivered a couple of weeks ago. Having finished brandishing his chain saw on some rather undeserving bay and box plants, he swapped chainsaw for drill and kindly erected the nest, as required, in a sunny spot 1.5m from the ground. I recognise it’s not the most elegant structure in the garden, but who am I to criticise a bee’s home? I’m now awaiting delivery of the bee filled cocoons which get placed into the breeding tubes (which look rather like cut lengths of bamboo) and are in turn placed within the plastic tube. This entry was posted in Garden, Red mason bees and tagged Chris Whittles, Val Bourne on March 13, 2016 by jenhumm116.